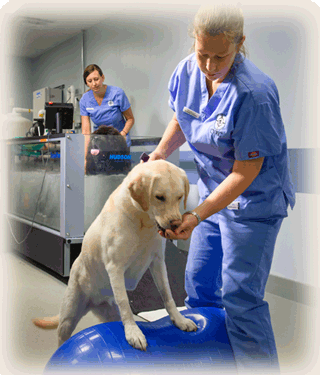 Animal Rehabilitation & Fitness (ARF) at the Charleston Veterinary Referral Center is proud to offer state of the art care in the area of physical rehabilitation. We have the ability to provide a full range of therapeutic modalities including underwater and land based treadmills, cold laser therapy, neuromuscular and transcutaneous electrical stimulation, therapeutic ultrasound, and thermal therapy. We also have unique equipment to assist our patients with balance, coordination, and strength training, including physioballs, balance boards, wobble boards, balance discs, and cavaletti rails. Our advanced rehabilitation center functions under the guidance of staff members specially trained and certified in sports medicine and rehabilitation (DACVSMR), canine rehabilitation (CCRT/CCRP) and canine therapeutic massage (CCMT). People undergo physical rehabilitation for a variety of disorders but mostly to restore function, increase mobility, promote balance, decrease pain, encourage healing, facilitate circulation and return to a normal lifestyle. The same is true for your pet! Physical rehabilitation is a non-invasive methodology used to improve the recovery of patients with both acute and chronic conditions. Most commonly used for patients that underwent orthopedic surgery or those with neurologic conditions, rehabilitation therapy can also be used for weight loss, conditioning of agility and sporting dogs, pain control, osteoarthritis, nonsurgical management of orthopedic conditions, and wound management.